Decorating cakes is a great skill to have as cakes can make the perfect gift. This is never truer than when the cake is for a birthday. The thoughtful and personal touch that making and giving a cake can bring to the occasion is remarkable and within this article we will be considering some birthday cake decorating ideas. If it is the birthday of a close friend or family member then it will be easier. Take time to sit down and consider what they like. Come up with several possible ideas, you don’t want to limit yourself. Once you have decide what the theme of the cake is going to be, draft out what you want it to look like on the cake. This will enable you to get an idea of spacing, sizes and colours. 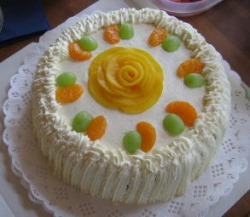 When you have your draft planned to perfection, ensure you know what you will need to recreate that image on the cake. Then write a list and hit the shops! Usually there will be icing of some kind, whether it will be royal icing or butter icing. As well as considering what the recipient of your gift prefers, also consider what will be easiest to work with. If you are creating a layered structure on top of your icing, you will have to go for royal as the butter icing will not support your design sufficiently. Don’t be under the illusion however, that royal icing has to be white. With the magic of food colouring, your birthday cake can be decorated in a whole rainbow of colours! Mix the textures! As you know, royal icing is smooth and butter icing is much more textured, there is no reason why you can't combine these when decorating your birthday cake. Royal icing is great for moulding, and it pretty much works just like play dough. Remember though that time is going to be needed for the more intricate design. Once you have your sculpture perfect – let it set! Cake decorating in recent years has regained popularity and this is especially true of birthday cakes. In the stores you will now find whole aisles dedicated to cake decorating from the traditional icing, to cute icing figures and special moulding pens and brushes. Take advantage of this and get the tools of the trade. 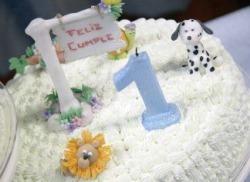 If you are not close to the person you are decorating the birthday cake for, go for a more traditional generic theme. Boys like sports, music and cartoons. Girls castles, shoes and bags. For the more mature recipient decorate their birthday cake following a flower theme for women. 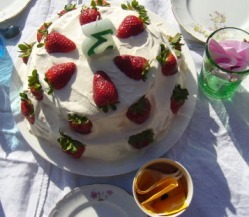 Most men like simple birthday cakes, like stripes or patterns. Pick one and you can easily create an amazing cake that will have the “wow” factor. The shape of the cake can be a key to a brilliantly original birthday cake. You can now get shaped cake tins in specialised stores. From frogs to pirate ships. Take full advantage of this! Although it is more than possible to create a shaped cake from traditional square and round tins, this can be rather time consuming.